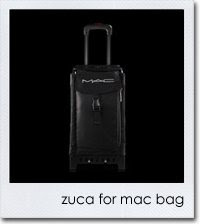 I was reading through Specktra yesterday and I noticed that MAC is putting out a new traincase partnered with a company called Zuca. I usually ignore MAC traincases because I feel that they are overpriced and too small...however this one stuck out because it was Nylon and a rolly type of traincase - which I prefer. I checked out MAC pro and the case was sold out! Even on Zuca's website they are on backorder, lol. 1)The luggage is only 8.5 pounds...way less than a traincase. My traincase from Yazmo is amazing but it's huge and so heavy. Try lifting that up flights of stairs...not fun! The smaller size of the traincase I think will also allow you to pack smarter. 2) It has an aluminum frame made of the same materials as airplanes which give it strength. 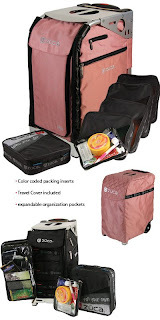 The top of the luggage is also used as a seat for up to 300lbs...great for doing makeup in tight spaces! 3) The wheels are like roller blade wheels so they are super quiet...and they also are recessed so they don't get in the way if you're storing this in an overhead compartment on a plane. 4) They contain 5 square mesh pouches that stack on top of each other like a shelf. You don't have to open the traincase horizontally...the luggage remains upright and you can unzip it revealing the stacked shelves. Perfect for keeping makeup inside the traincase and organized! This is my favorite part of the traincase. 5) It has a cover for air travel. 6) You can remove the nylon waterproof fabric from the frame and wash it in the washing machine. Great to clean up any makeup spills! I'm in love! But it's $295! I don't neeeddddd it since I have two really awesome traincases...but it's calling my name? What do you think ladies, should I get it? its soooo nice! i saw this when MAC pro emailed me their update! i literally drooled all over my keyboard. so nice! that site for the lashes were such a lucky find. their customer service is good too. glad i could be a help. so what dates will you be in San Fran? i don't live here but i work here and would love to take you out! what do you have time for? zomg! its nice, but it would look even nicer with your logo splattered all over it! my personal preference is for the hard train cases cause i seriously bang up my stuff badly. I think you have been working hard and should reward yourself by getting this traincase. Get it and maybe sell one of your others to help defray the cost? I love it too, but damn that's so steep! Since its not limited edition I think you can pass until you needdddd it. =) but it is a VERY nice train case. hehehe I want it too but dang that a steep price! lol But you are moving right? lol Yeah thats a really nice traincase though good job on the research! that looks really sleak and user friendly. i love your train case now. so much room. but the fact that it's lighter is a great investment. go for it! you're going to be doing makeup for a long time and only go further. I've been wanting this for a while! I couldn't justify spending the 3bills on it though so I ordered the Yazmo one instead. After luggin my yazmo one around airports n such during my trip to Cabo, I soooo wish I bought the Zuca instead. It's steep, but you get what you pay for! Few more gigs n I'm buying this baby! It is beautiful. But if you don't need it, let it go. It is an investment and it is also calling my name.